On Monday, Nov. 13, the Sarasota County Council of Neighborhood Associations (CONA) will feature a presentation by Sura Kochman, an organizer of the Pine Shores Neighborhood Alliance, regarding the latest plans for the proposed Siesta Promenade project. Benderson Development Co. submitted an application to Sarasota County in 2016 to build a mixed-use development on the property the company owns at the northwest corner of U.S. 41 and Stickney Point Road. Plans call for condominiums, a hotel and retail space. 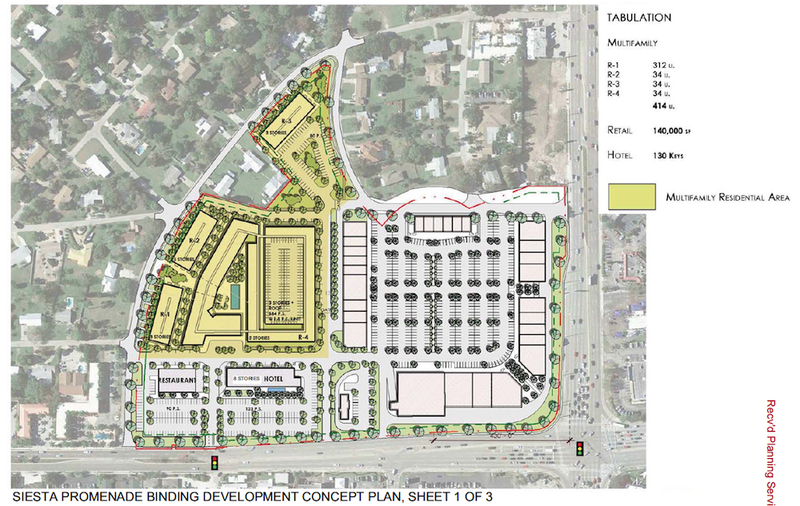 “The location is bounded by commercial development on the three other corners and includes the southern access road between the mainland and Siesta Key to the west, and to the east, Clark Road, which leads to Interstate 75,” a CONA news release says. “This already is a major intersection with extensive congestion,” the release adds. A question-and-answer session will follow her presentation. The meetings are held at the Sarasota Garden Club, which is located at 1131 Boulevard of the Arts in Sarasota. The club building is at the intersection of North Tamiami Trail, just south of the Municipal Auditorium; the parking lot and entrance may be reached from Van Wezel Way.